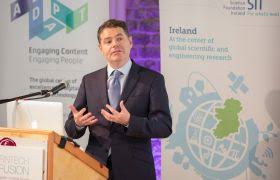 Minister for Finance and Public Expenditure and Reform, Paschal Donohoe T.D., and the ADAPT Centre for Digital Content Technology, an SFI Research Centre, have announced a new Financial Technology (FinTech) research programme, FinTech Fusion. The academic and industry research partnership was launched today (21st September 2018) in Dublin city centre. FinTech Fusion will encourage breakthroughs in payment (PayTech), regulation (RegTech) and insurance (InsureTech) technologies by accelerating scientific progress and enabling data-driven research. FinTech Fusion’s academic researchers will work together with more than a dozen companies including Deutsche Börse, Accenture's The Dock, Fidelity Investments, Microsoft, Gecko Governance, FINEOS and Zurich, to develop FinTech innovations that will have the potential to impact economies, markets, companies and individuals.